Electrocardiography showing precordial leads in hyperkalemia. Hyperkalemia, also spelled hyperkalaemia, is an elevated level of potassium (K+) in the blood serum. Normal potassium levels are between 3.5 and 5.0 mmol/L (3.5 and 5.0 mEq/L) with levels above 5.5 mmol/L defined as hyperkalemia. Typically this results in no symptoms. Occasionally when severe it results in palpitations, muscle pain, muscle weakness, or numbness. An abnormal heart rate can occur which can result in cardiac arrest and death. Common causes include renal failure, hypoaldosteronism, and rhabdomyolysis. A number of medications can also cause high blood potassium including spironolactone, NSAIDs, and angiotensin converting enzyme inhibitors. The severity is divided into mild (5.5-5.9 mmol/L), moderate (6.0-6.4 mmol/L), and severe (>6.5 mmol/L). High levels can also be detected on an electrocardiogram (ECG). Pseudohyperkalemia, due to breakdown of cells during or after taking the blood sample, should be ruled out. Initial treatment in those with ECG changes is calcium gluconate. Medications that might worsen the condition should be stopped and a low potassium diet should be recommended. Other medications used include dextrose with insulin, salbutamol, and sodium bicarbonate. Measures to remove potassium from the body include furosemide, polystyrene sulfonate, and hemodialysis. Hemodialysis is the most effective method. The use of polystyrene sulfonate, while common, is poorly supported by evidence. Hyperkalemia is rare among those who are otherwise healthy. Among those who are in hospital, rates are between 1% and 2.5%. It increases the overall risk of death by at least ten times. The word "hyperkalemia" is from hyper- meaning high; kalium meaning potassium; and -emia, meaning "in the blood". Normal serum potassium levels are generally considered to be between 3.5 and 5.0 mmol/L. Levels above 5.5 mmol/L generally indicate hyperkalemia, and those below 3.5 mmol/L indicate hypokalemia. The symptoms of an elevated potassium level are nonspecific, and generally include malaise, palpitations, and muscle weakness. Hyperventilation may indicate a compensatory response to metabolic acidosis, which is one of the possible causes of hyperkalemia. Often, however, the problem is detected during screening blood tests for a medical disorder, or after hospitalization for complications such as cardiac arrhythmia or sudden cardiac death. High levels of potassium (> 5.5 mmol/L) have been associated with cardiovascular events. Physicians taking a medical history may focus on kidney disease, medication use (e.g. potassium-sparing diuretics), which are common causes. Gordon's syndrome (pseudohypoaldosteronism type II) ("familial hypertension with hyperkalemia"), a rare genetic disorder caused by defective modulators of salt transporters, including the thiazide-sensitive Na-Cl cotransporter. Excessive intake with potassium salt-substitute, potassium-containing dietary supplements, or potassium chloride (KCl) infusion. For a person with normal kidney function and normal elimination, hyperkalemia by potassium intake would be seen only with large infusions of KCl or oral doses of several hundred milliequivalents of KCl. Pseudohyperkalemia is a rise in the amount of potassium that occurs due to excessive leakage of potassium from cells, during or after blood is drawn. It is a laboratory artifact rather than a biological abnormality and can be misleading to caregivers. Pseudohyperkalemia is typically caused by hemolysis during venipuncture (by either excessive vacuum of the blood draw or by a collection needle that is of too fine a gauge); excessive tourniquet time or fist clenching during phlebotomy (which presumably leads to efflux of potassium from the muscle cells into the bloodstream); or by a delay in the processing of the blood specimen. It can also occur in specimens from patients with abnormally high numbers of platelets (>500,000/mm³), leukocytes (> 70 000/mm³), or erythrocytes (hematocrit > 55%). People with "leakier" cell membranes have been found, whose blood must be separated immediately to avoid pseudohyperkalemia. A familial form of pseudohyperkalemia occurs, which is a dominant red-cell trait characterized by increased serum potassium in whole blood stored at or below room temperature, without additional hematological abnormalities. It appears due to mutations in Langereis blood group antigen, which encodes an erythrocyte membrane porphyrin transporter. The gene, known as ABCB6, is located on the long arm of chromosome 2 (2q36). Potassium is the most abundant intracellular cation and about 98% of the body's potassium is found inside cells, with the remainder in the extracellular fluid including the blood. Membrane potential is maintained principally by the concentration gradient and membrane permeability to potassium with some contribution from the Na+/K+ pump. The potassium gradient is critically important for many physiological processes, including maintenance of cellular membrane potential, homeostasis of cell volume, and transmission of action potentials in nerve cells. Potassium is eliminated from the body through the gastrointestinal tract, kidney and sweat glands. In the kidneys, elimination of potassium is passive (through the glomeruli), and reabsorption is active in the proximal tubule and the ascending limb of the loop of Henle. There is active excretion of potassium in the distal tubule and the collecting duct; both are controlled by aldosterone. In sweat glands potassium elimination is quite similar to the kidney, its excretion is also controlled by aldosterone. Regulation of serum potassium is a function of intake, appropriate distribution between intracellular and extracellular compartments, and effective bodily excretion. In healthy individuals, homeostasis is maintained when cellular uptake and kidney excretion naturally counterbalance a patient’s dietary intake of potassium. When kidney function becomes compromised, the ability of the body to effectively regulate serum potassium via the kidney declines. To compensate for this deficit in function, the colon increases its potassium secretion as part of an adaptive response. However, serum potassium remains elevated as the colonic compensating mechanism reaches its limits. Hyperkalemia develops when there is excessive production (oral intake, tissue breakdown) or ineffective elimination of potassium. Ineffective elimination can be hormonal (in aldosterone deficiency) or due to causes in the kidney parenchyma that impair excretion. Increased extracellular potassium levels result in depolarization of the membrane potentials of cells due to the increase in the equilibrium potential of potassium. This depolarization opens some voltage-gated sodium channels, but also increases the inactivation at the same time. Since depolarization due to concentration change is slow, it never generates an action potential by itself; instead, it results in accommodation. Above a certain level of potassium the depolarization inactivates sodium channels, opens potassium channels, thus the cells become refractory. This leads to the impairment of neuromuscular, cardiac, and gastrointestinal organ systems. Of most concern is the impairment of cardiac conduction, which can cause ventricular fibrillation, abnormally slow heart rhythms, or asystole. During extreme exercise, potassium is released from active muscle, and the serum potassium rises to a point that would be dangerous at rest. High levels of adrenaline and noradrenaline have a protective effect on the cardiac electrophysiology because they bind to beta 2 adrenergic receptors, which, when activated, extracellularly decrease potassium concentration. Patients with the rare hereditary condition of hyperkalemic periodic paralysis appear to have a heightened muscular sensitivity that is associated with transient elevation of potassium levels. Episodes of muscle weakness and spasms can be precipitated by exercise or fasting in these subjects. To gather enough information for diagnosis, the measurement of potassium must be repeated, as the elevation can be due to hemolysis in the first sample. The normal serum level of potassium is 3.5 to 5 mmol/L. Generally, blood tests for kidney function (creatinine, blood urea nitrogen), glucose and occasionally creatine kinase and cortisol are performed. Calculating the trans-tubular potassium gradient can sometimes help in distinguishing the cause of the hyperkalemia. Also, electrocardiography (EKG/ECG) may be performed to determine if there is a significant risk of abnormal heart rhythms. With mild to moderate hyperkalemia, there is prolongation of the PR interval and development of peaked T waves. Severe hyperkalemia results in a widening of the QRS complex, and the ECG complex can evolve to a sinusoidal shape. There appears to be a direct effect of elevated potassium on some of the potassium channels that increases their activity and speeds membrane repolarization. Also, (as noted above), hyperkalemia causes an overall membrane depolarization that inactivates many sodium channels. 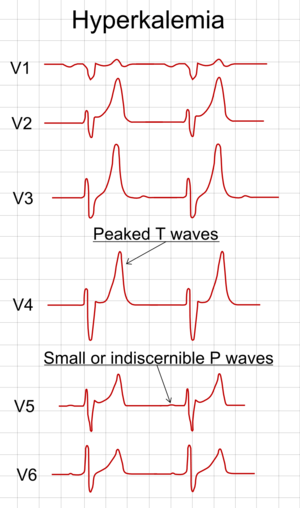 The faster repolarization of the cardiac action potential causes the tenting of the T waves, and the inactivation of sodium channels causes a sluggish conduction of the electrical wave around the heart, which leads to smaller P waves and widening of the QRS complex. The serum potassium concentration at which electrocardiographic changes develop is somewhat variable. Although the factors influencing the effect of serum potassium levels on cardiac electrophysiology are not entirely understood, the concentrations of other electrolytes, as well as levels of catecholamines, play a major role. ECG findings are not a reliable finding in hyperkalemia. In retrospective review, blinded cardiologists documented peaked T-waves in only 3 of 90 ECGs with hyperkalemia. Sensitivity of peaked-Ts for hyperkalemia ranged from 0.18 to 0.52 depending on the criteria for peak-T waves. Preventing recurrence of hyperkalemia typically involves reduction of dietary potassium, removal of an offending medication, and/or the addition of a diuretic (such as furosemide or hydrochlorothiazide). Sodium polystyrene sulfonate and sorbitol (combined as Kayexalate) are occasionally used on an ongoing basis to maintain lower serum levels of potassium though the safety of long-term use of sodium polystyrene sulfonate for this purpose is not well-understood. High dietary sources include vegetables such as tomatoes and potatoes, fruits such as oranges and bananas and nuts. Emergency lowering of potassium levels is needed when new arrhythmias occur at any level of potassium in the blood, or when potassium levels exceed 6.5 mmol/l, . Several agents are used to transiently lower K+ levels. Choice depends on the degree and cause of the hyperkalemia, and other aspects of the person's condition. Calcium (calcium chloride or calcium gluconate) increases threshold potential through a mechanism that is still unclear, thus restoring normal gradient between threshold potential and resting membrane potential, which is elevated abnormally in hyperkalemia. A standard ampule of 10% calcium chloride is 10 mL and contains 6.8 mmol of calcium. A standard ampule of 10% calcium gluconate is also 10 mL but has only 2.26 mmol of calcium. Clinical practice guidelines recommend giving 6.8 mmol for typical EKG findings of hyperkalemia. This is 10 mL of 10% calcium chloride or 30 mL of 10% calcium gluconate. Though calcium chloride is more concentrated, it is caustic to the veins and should only be given through a central line. Onset of action is less than one to three minutes and lasts about 30–60 minutes. The goal of treatment is to normalize the EKG and doses can be repeated if the EKG does not improve within a few minutes. Some textbooks suggest that calcium should not be given in digoxin toxicity as it has been linked to cardiovascular collapse in humans and increased digoxin toxicity in animal models. Recent literature questions the validity of this concern. Several medical treatments shift potassium ions from the bloodstream into the cellular compartment, thereby reducing the risk of complications. The effect of these measures tends to be short-lived, but may temporize the problem until potassium can be removed from the body. Insulin (e.g. intravenous injection of 10-15 units of regular insulin along with 50 ml of 50% dextrose to prevent hypoglycemia) leads to a shift of potassium ions into cells, secondary to increased activity of the sodium-potassium ATPase. Its effects last a few hours, so it sometimes must be repeated while other measures are taken to suppress potassium levels more permanently. The insulin is usually given with an appropriate amount of glucose to prevent hypoglycemia following the insulin administration. Salbutamol (albuterol), a β2-selective catecholamine, is administered by nebulizer (e.g. 10–20 mg). This drug also lowers blood levels of K+ by promoting its movement into cells. Sodium bicarbonate may be used with the above measures if it is believed the person has metabolic acidosis. Severe cases require hemodialysis or hemofiltration, which are the most rapid methods of removing potassium from the body. These are typically used if the underlying cause cannot be corrected swiftly while temporizing measures are instituted or there is no response to these measures. Potassium can bind to agents in the gastrointestinal tract. Sodium polystyrene sulfonate with sorbitol (Kayexalate) has been approved for this use and can be given by mouth or rectally. However, careful clinical trials to demonstrate the effectiveness of sodium polystyrene are lacking, and use of sodium polystyrene sulfonate, particularly if with high sorbitol content, is uncommonly but convincingly associated with colonic necrosis. There are no systematic studies (>6 months) looking at the long-term safety of this medication. Another medication by the name of patiromer was approved in 2015. Loop diuretics (furosemide, bumetanide, torasemide) can increase kidney potassium excretion in people with intact kidney function. Fludrocortisone, a synthetic mineralocorticoid, can also increase potassium excretion by the kidney in patients with functioning kidneys. Trials of fludrocortisone in patients on dialysis have shown it to be ineffective. Patiromer is a selective sorbent that is taken by mouth and works by binding free potassium ions in the gastrointestinal tract and releasing calcium ions for exchange, thus lowering the amount of potassium available for absorption into the bloodstream and increasing the amount that is excreted via the feces. The net effect is a reduction of potassium levels in the blood serum. In the United States, hyperkalemia is induced by lethal injection in capital punishment cases. Potassium chloride is the last of the three drugs administered and actually causes death. Injecting potassium chloride into the heart muscle disrupts the signal that causes the heart to beat. This same amount of potassium chloride would do no harm if taken orally and not injected directly into the blood. Sodium zirconium cyclosilicate (ZS-9) is an investigational selective oral sorbent that binds potassium in the gastrointestinal tract in exchange for sodium and hydrogen ions. 1 2 3 4 5 6 7 8 9 10 11 12 Lehnhardt, A; Kemper, MJ (March 2011). "Pathogenesis, diagnosis and management of hyperkalemia.". Pediatric nephrology (Berlin, Germany). 26 (3): 377–84. PMID 21181208. 1 2 3 4 5 6 7 8 9 Soar, J; Perkins, GD; Abbas, G; Alfonzo, A; Barelli, A; Bierens, JJ; Brugger, H; Deakin, CD; Dunning, J; Georgiou, M; Handley, AJ; Lockey, DJ; Paal, P; Sandroni, C; Thies, KC; Zideman, DA; Nolan, JP (October 2010). "European Resuscitation Council Guidelines for Resuscitation 2010 Section 8. Cardiac arrest in special circumstances: Electrolyte abnormalities, poisoning, drowning, accidental hypothermia, hyperthermia, asthma, anaphylaxis, cardiac surgery, trauma, pregnancy, electrocution.". Resuscitation. 81 (10): 1400–33. PMID 20956045. 1 2 3 4 McDonald, TJ; Oram, RA; Vaidya, B (20 October 2015). "Investigating hyperkalaemia in adults.". BMJ (Clinical research ed.). 351: h4762. PMID 26487322. ↑ Mahoney, BA; Smith, WA; Lo, DS; Tsoi, K; Tonelli, M; Clase, CM (18 April 2005). "Emergency interventions for hyperkalaemia.". The Cochrane database of systematic reviews (2): CD003235. PMID 15846652. 1 2 Kamel KS, Schreiber M; Schreiber (2012). "Asking the question again: Are cation exchange resins effective for the treatment of hyperkalemia?". Nephrology Dialysis Transplantation. 27 (12): 4294–7. doi:10.1093/ndt/gfs293. PMID 22989741. 1 2 Kovesdy, CP (6 September 2016). "Updates in hyperkalemia: Outcomes and therapeutic strategies.". Reviews in endocrine & metabolic disorders. PMID 27600582. ↑ Cohen, Barbara J.; DePetris, Ann (2013). Medical Terminology: An Illustrated Guide. Lippincott Williams & Wilkins. p. 326. ISBN 9781451187564. ↑ Herlihy, Barbara (2014). The Human Body in Health and Illness. Elsevier Health Sciences. p. 487. ISBN 9781455756421. ↑ "High potassium (hyperkalemia) When to see a doctor - Symptoms". Mayo Clinic. 2011-11-18. Retrieved 2014-02-28. ↑ Brown, Robert (November 5, 1984). "Potassium Homeostasis and clinical implications". The American Journal of Medicine. 77: 3–10. doi:10.1016/s0002-9343(84)80002-9. ↑ Weiner, ID; Linas, SL; Wingo, CS (2010). Johnson, R.; Fluege, J.; Feehally, J., eds. Comprehensive Clinical Nephrology 4th ed. Chapter 9 Disorder of Potassium Metabolism: Saunders elsevier. pp. 118–129. ↑ Mathialahan, T; Maclennan, KA; Sandle, LN; Verbeke, C; Sandle, GI (2005). "Enhanced large intestinal potassium permeability in end-stage renal disease". Journal of Pathology. 206 (1): 46–51. doi:10.1002/path.1750. PMID 15772943. ↑ Evans, KJ; Greenberg, A (2005). "Hyperkalemia: A review". J Intensive Care Med. 20 (5): 272–290. doi:10.1177/0885066605278969. PMID 16145218. ↑ Desai, A (14 October 2008). "Hyperkalemia associated with inhibitors of the renin-angiotensin-aldosterone system: balancing risk and benefit.". Circulation. 118 (16): 1609–11. doi:10.1161/circulationaha.108.807917. PMID 18852376. ↑ Lindinger MI (April 1995). "Potassium regulation during exercise and recovery in humans: implications for skeletal and cardiac muscle". J. Mol. Cell. Cardiol. 27 (4): 1011–1022. doi:10.1016/0022-2828(95)90070-5. PMID 7563098. ↑ "POTASSIUM AND YOUR CKD DIET". Retrieved 21 December 2015. ↑ HOLLANDER-RODRIGUEZ, JC; CALVERT, J (2006). "Hyperkalemia". Am Fam Physician. 73 (2): 283–90. PMID 16445274. ↑ Weiner, DI; Linas, SL; Wingo, CS (2010). Comprehensive Clinical Nephrology (4th ed.). Chapter 9: Disorders of potassium metabolism: Saunders Elsevier. pp. 118–129. ↑ Harel, Z; Harel, S; Shah, PS; et al. (2013). "Gastrointestinal adverse events with sodium polystyrene sulfonate (kayexalate) use: a systematic review.". Am J Med. 126 (264): e9–264.e24. doi:10.1016/j.amjmed.2012.08.016. ↑ "FDA approves new drug to treat hyperkalemia". FDA. October 21, 2015. Retrieved 1 November 2015.